From June 14-16, CatholicTV will exhibit at The Cable Show in Chicago. 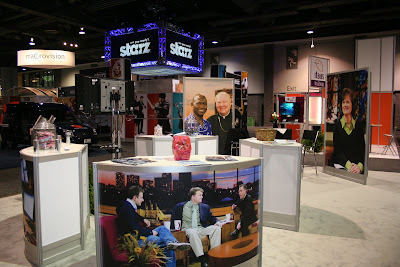 This is the fourth year that CatholicTV has exhibited at this industry gathering. The Cable Show 2011, is hosted by the National Cable & Telecommunication Association (NCTA). This year’s event is the 60th Annual Cable Show and is Co-Chaired by Discovery’s David Zaslav and Suddenlink’s Jerry Kent. The Cable Show will include attendees from over 52 foreign countries and will also be attended by cable operators such as Time Warner, Comcast, Cox Communications, and many more. Mr. Patrick McCaskey of the Chicago Bears will be a featured guest at the CatholicTV exhibit booth on the afternoon of June 16th. CatholicTV’s exhibit will offer samples of CatholicTV programming and social media; it is hosted by CatholicTV Network President Father Robert Reed, Executive Vice President Jay Fadden, and Marketing Programming Manager Bonnie Rodgers. CatholicTV works to grow its presence on television around the nation in order to bring more religious, educational, and entertaining programming to Catholics around the U.S. The number of people who signed the petition mentioned above recently reached over 10,000.